NASA's next Mars mission, Maven, is being prepared for its mission within Lockheed Martin's high-bay cleanroom at a facility in Littleton, Colo.
LITTLETON, Colo. – NASA's next mission to the Red Planet is undergoing extensive testing in preparation for its launch next year. 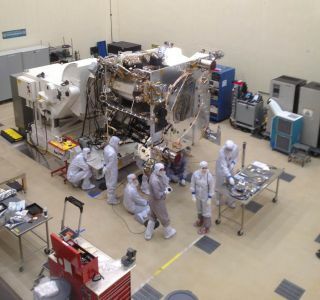 Here within a Lockheed Martin Space Systems high-bay cleanroom, technicians are in tender-loving-care mode, busily outfitting and testing the Mars Atmosphere And Volatile EvolutioN (Maven) spacecraft. This probe has a literal thirst for knowledge. Maven's launch period is a 20 day window between Nov. 18 and Dec. 7, 2013. If the spacecraft is hurled Marsward on day one of that window, it will insert itself into orbit around the planet on Sept. 22, 2014. Following a five-week commissioning phase, Maven is to settle into its primary mission, roughly in the opening days of November 2014. Maven's one-Earth-year mission allows thorough coverage of near-Mars space. The probe is built to answer questions about the history of Martian volatiles and atmosphere, essential data to help reveal the nature of planetary habitability. Maven is shown studying how Mars loses its atmosphere to space in this artist's illustration. Maven is deep in assembly, test and launch operations, a critical phase dubbed ATLO, said Tim Priser, Lockheed Martin's chief engineer for the spacecraft. "If you look at the physical characteristics of Maven, it is a direct descendent of our Mars Reconnaissance Orbiter," Priser told SPACE.com. The fully loaded Maven tips the scale at the same weight of a GMC Yukon, a little over 5,620 pounds (2,550 kilograms). When its fixed solar arrays are stretched out, Maven's wingtip-to-wingtip length is as long as a school bus, 37 feet (11.3 meters). Over the last few months technicians have installed the subsystems on the main spacecraft structure — the avionics, power, telecomm, mechanisms, thermal systems, and guidance, navigation and control. The propulsion system was installed earlier this year and the spacecraft was powered up in August with flight software for the first time. After the holidays, Maven will go through rigorous environmental testing, Priser said, "to characterize the beast." That evaluation means moving Maven from its cleanroom to a nearby special facility in which the spacecraft undergoes shake, rattle and vibration that simulates the craft's Atlas 5 rocket launch, as well as profiling its magnetic cleanliness. "We're going to shake the spacecraft on a new three-axis shake table," Priser said. As Maven's chief engineer, Priser has been advised by others that have used the large test gear he's likely not going to like what he sees — and might need a barf bag handy. "But when it gets through and out the other side, you feel a whole lot more confident." Well-dressed and entering Maven's haven, are, left to right: SPACE.com's Leonard David; Jeff Coyne, Maven assembly, test and launch operations (ATLO) manager at Lockheed Martin; and Gary Napier, communications specialist for Lockheed Martin Space Systems. The sensitivity of Maven's science gear led to challenges in building the spacecraft, and called for very clever circuitry and wiring solutions to reduce interference with instruments, Priser said. Also, magnetometers on the spacecraft had to be positioned away from solar array magnetic perturbations. From its elliptical orbit around Mars, Maven is slated to fly five "deep-dip" campaigns that skim the atmosphere — all part of the plan to probe the Red Planet's upper atmosphere, ionosphere and interactions with the sun and solar wind. An advisory group will keep an eye on atmosphere-influencing dust storms on the planet and provide counsel on the timing of Maven's deep-dip maneuvers, Priser said. So far, the building and testing of Maven has gone smoothly, Priser said, "and all indicators are that it will continue to do that." The Mars Reconnaissance Orbiter heritage of people and hardware experience has enabled the Maven project to go well, he said. The target time for delivery of Maven to its Florida launch facility is the first week of August next year, Priser said. Following liftoff, an early nerve-wracking item on the Maven outbound checklist is getting the solar arrays deployed, said he added. En route to Mars, instrument health checks will be performed and the spacecraft's magnetometers are to be turned on to start collecting data. Maven will then make a series of propellant-gulping maneuvers to finesse itself into the desired science orbit. Valuable Maven science can be done for a full nine years of a possible extended mission. But first things first, Priser said: "We've got a fixed launch window breathing down our neck," he concluded. Instruments on the spacecraft are provided by the University of California, Berkeley, the University of Colorado, Boulder, and NASA Goddard, with the Centre d'Etude Spatiale des Rayonnements in Toulouse, France, providing the sensor for one instrument. NASA's Jet Propulsion Laboratory in Pasadena, Calif., has provided the Electra telecommunications relay package that's onboard Maven. The mission is part of NASA's Mars Scout program. The Laboratory for Atmospheric and Space Physics (LASP) at the University of Colorado, Boulder is in charge of coordinating the science team and distributing the science derived by Maven. Bruce Jakosky from University of Colorado is the Maven principal investigator. Overseeing the health of the spacecraft as it operates around Mars will be done via the Lockheed Martin Mission Support Area.